First-grader Junie B. Jones is super-excited about the upcoming Holiday Sing-Along and Secret Santa gift exchange at her school. Too bad tattletale May keeps ruining all of Junie B.’s fun. 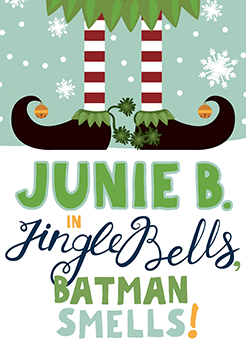 So when Junie B. draws May’s name for Secret Santa, she comes up with the perfect plan to teach her nemesis a lesson! But will the Christmas spirit of peace and goodwill interfere before she can give you-know-who what she deserves? A hilarious and endearing tale based on the best-selling book series by Barbara Park.